A propulsion system of a lever propelled bicycle that utilizes a right and left side assembly consisting of two sets of linear chain links with an offset connection to one another by a spacer means, wherein each assembly is able by said spacer connection means to wrap around separate radial drive members at least 1 3/4 revolutions without wrapping around itself, therefore providing the rotational pulling means of it. 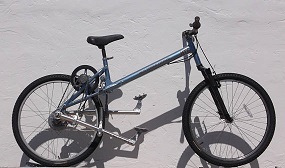 OFFERING THE OPTION TO BUY, LEASE OR RENT THE PATENT OR BUY AN ALUMINUM P-CLASSIC BICYCLE FOR $600.00 TO RESALE OR RENT. FOR NEGOTIATION CONTACT DEALER AT (919) 888-9232. This invention pertains to the essence of the levercycle's technology, thus any frame design (carbon fiber/aluminum) can be applied to this mechanism. 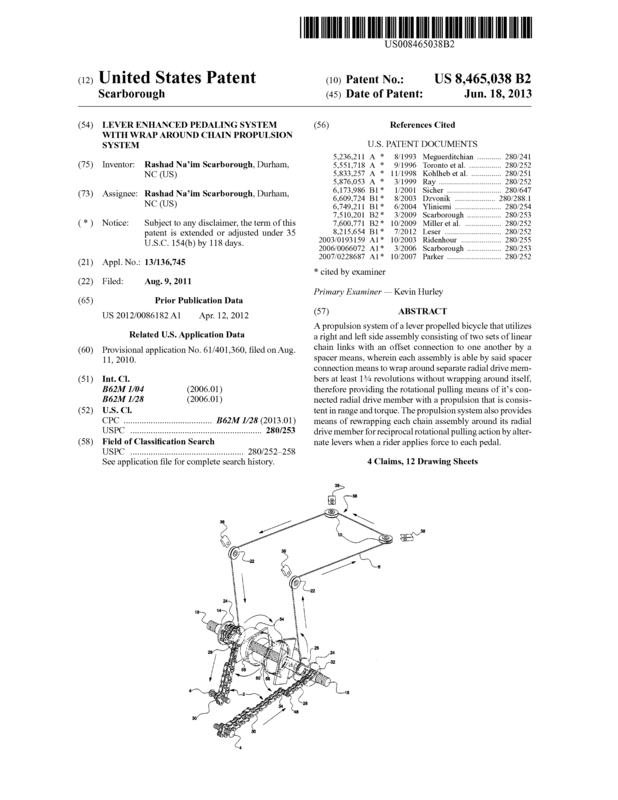 Other deals along with the purchase of this patent would include international patents rights (PCT) to frame designs more advanced than the frame illustrated in the patent and a multi-speed system that is compatible with this bike. Because the wrap around system offers low pedaling resistance (lpr) is why the technology would offer more mechanical advantages than bicycles in its class. It is recommended that such an invention be sold wholesale to stores like Wal-Mart, Target and K-Mart in order to get the most monitary value out of this invention. Thus, with that in mind the value of the patent over a 20 year term internationally would be worth $250,000.00 to $500,000.00. The inventor is willing to negotiate any deal that would lead up to stated apraisal. I am looking to lease the patent or partner with a company to market the cycles. This includes leasing the patent or forming a partnership with a company to market the bicycles. Page created at 2019-04-25 14:24:19, Patent Auction Time.